In The Roots of Pope Francis's Social and Political Thought Thomas R. Rourke traces the development of Pope Francis's thinking from his time as a Jesuit provincial through today. Meticulously researched, the book draws on decades of previously untranslated writings from Father Jorge Bergoglio, SJ, who went on to become Archbishop and Cardinal, as well as recent writings as Pope. The book explores the deepest roots of Pope Francis's thinking, beginning with the experience of the Jesuit missions in Argentina (1500s - 1700s), showing how both the success and tragedy of the missions profoundly formed his social and political views. Subsequent chapters explore influences from the Second Vatican Council through today regarding culture, politics, and economics. In Pope Francis's understanding, there is a perpetual tension between the attempts to redeem the social order through the Gospel and the never-ending attempts to dominate peoples and their lands through a variety of imperial projects that come from the powerful. What emerges is a profoundly Christian approach to the social, political, and economic problems of our time. The Pope is portrayed as an original thinker, independent of ideological currents, rooted in the Gospels and the tradition of Catholic social thought. In a time of division and violence, the writings of Pope Francis often point to the path of peace and justice. 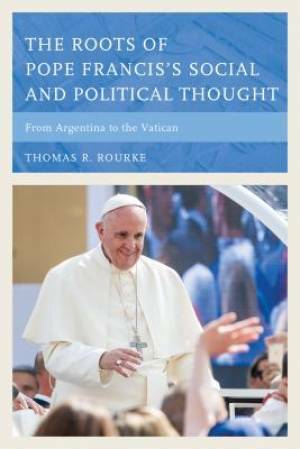 The Roots of Pope Francis's Social and Political Thought by Thomas R. Rourke was published by Rowman & Littlefield in September 2016. The ISBN for The Roots of Pope Francis's Social and Political Thought is 9781442272712. Be the first to review The Roots of Pope Francis's Social and Political Thought! Got a question? No problem! Just click here to ask us about The Roots of Pope Francis's Social and Political Thought.